If your basement is an area in the house that is of little use aside from being a laundry and storage area, don’t let the extra space go to waste. Consider decorative concrete repair to address the damages on the walls, ceiling, and floors. After that, you can make the necessary renovations to convert it into a living space. Aside from the advantage of having some extra room for recreation, it is an affordable way to increase the value of your home. It’s not as difficult as it sounds either. 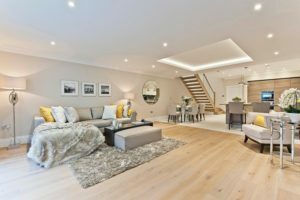 Read on for tips on how you can convert your basement into a living area. Give the floor a revamp. The cold gray concrete floors simply won’t do anymore. It occupies the largest space in your basement and you need it to be inviting and appealing. Opt for concrete resurfacing for an entirely renewed floor. Your basement stairs don’t have to look like it’s leading to a dungeon of some sort if it’s going to be regularly used. It has to look like it’s leading to a place of comfort and relaxation. Have it expanded and add a sturdy handrail for added safety. Lack of light and ventilation make most basements dark and musty over the years. If there is a chance to install windows, take it. Adding windows let much-needed light in and improves air circulation. Go for a light color scheme. Basements are naturally dark so it helps to do as much as you can in making the area brighter. Applying light color schemes are a great way to do so. You can do this with paint, furnishing, and decor. Add some warmth with lighting. Adding warm artificial lights can drastically improve the ambiance of your basement. Choose lighting that covers a lot of space. Doing so takes out the gloom and adds coziness to the area that’s made for comfort. Consider protection from cold and moisture. Aside from basements being naturally dark, it’s also naturally cold and damp. Not exactly the image of comfort is it? Have wall insulation installed and waterproof your basement to protect yourself from cold and moisture.